The past few years have brought a sharp upturn in the numbers of unaccompanied children arriving in the United States, and most have come from Mexico and the Central American countries which make up the Northern Triangle: Guatemala, Honduras, and El Salvador. Of the 15,647 unaccompanied minors apprehended by U.S. authorities from October 2014 to March of this year, 5,572 were from Mexico, 5,465 from Guatemala, 2,788 from El Salvador, and 1,549 from Honduras. Of the children apprehended in the past two years, more than three quarters were caught in Texas, crossing the Rio Grande. The majority of these are children, who are usually between ages 15 and 17, but younger ones, and especially girls, have been arriving in increasing numbers within the last year. In fact, new data by Pew Research indicates a 117 percent increase in the number of unaccompanied children ages 12 and younger caught at the U.S.-Mexico border this fiscal year compared with the year before. Yet people keep coming, driven in large measure by conditions of poverty that continue to plague much of the region. 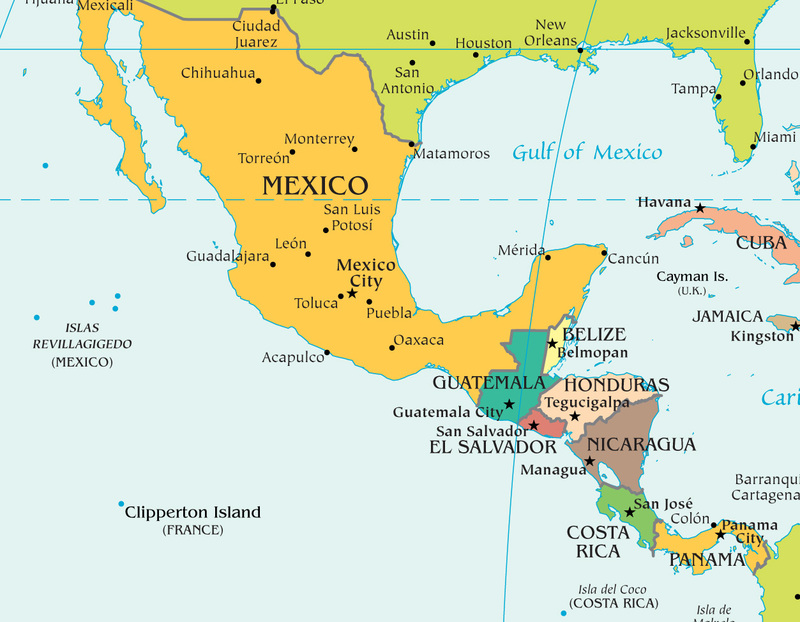 Half of Central America’s population exists below the poverty line, and in rural areas two out of three people are poor. Desperate, family members attempt to migrate to the United States to earn money and send it home. Often, after some time has passed, the children they left in their wake travel north. 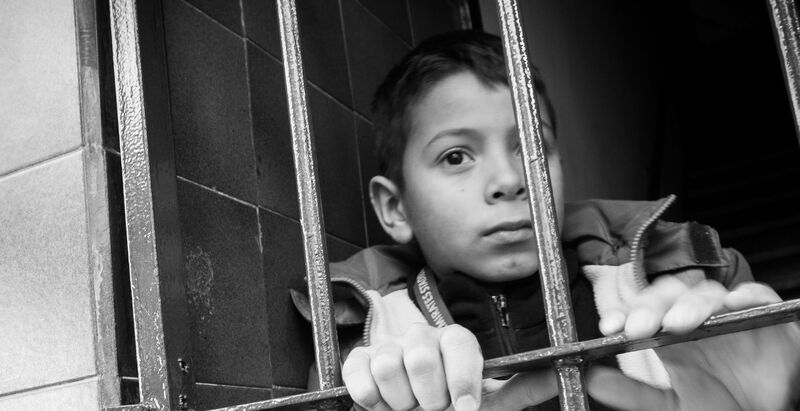 Central American Kids get Court Dates — Mexican Kids get the Boot. 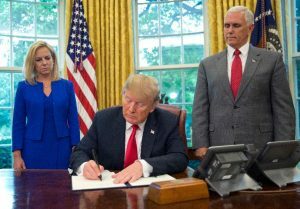 In 2008 the U.S. Congress passed the William Wilberforce Trafficking Victims Protection Reauthorization Act to protect child migrants from “non-contiguous countries” from being pushed across the border and back into the clutches of the trafficking networks. The act exempted children arriving from these countries from immediate deportation. Instead, these children were transferred into the custody of the Office of Refugees and Resettlement and given a future court date to make a case for remaining in the U.S. The three criteria in determining if a child would be exempt from deportation are: 1.) whether the child has been a victim of severe forms of abuse, 2.) if he/she would be returned to mistreatment if deported; and 3.) if the child lacks the ability to make an independent decision regarding his/her application for admission to the United States. For youths from non-contiguous countries, the U.S. Border Patrol has 72 hours to transfer children to the custody of the Office of Refugee Resettlement (ORR). But for Mexican children, U.S. officials are given just 48 hours to process the repatriations back across the border. Moreover, there has been a pattern of expediting the process of deporting Mexican children, greatly reducing their chances of obtaining relief by applying for Special Immigrant Juvenile (SIJ) visas under U.S. law, an immigration classification that allows abused, abandoned, or neglected children to immediately apply for lawful permanent resident status. Unfortunately, Mexican children, in contrast to Central American children, rarely are able to have contact with the Office of Refugees and Resettlement. Screening is supposed to be performed to determine whether refugees have a credible claim for being granted permission to stay in the country, but U.S. border agents do not always review circumstances of each detainee with care. Worse, immigrants without legal status do not have the right to government-appointed legal counsel in any removal proceedings. Most unaccompanied children appear in court without a lawyer, where their young age and inability to speak English proficiently preclude them from really comprehending what is happening to them. The U.S. legal system appears ill-equipped to offer adequate legal protection to youthful migrants. As a result, the present system is failing to protect vulnerable child populations. Some of the youthful migrants are picked up by family. But, “because of [the vast legal] backlog, which is growing greatly with the recent influx, in essence a kid released tomorrow could stay in the U.S. for up to three years waiting for their court date,” explains NPR’s Carrie Kahn. When the day in court arrives, many unaccompanied migrant children often fail to show up for their court dates; the lengthy period of time between apprehension and hearing leads some to drift off, moving away to live with family members already in the country. Some skip their court date due to the threat of a negative outcome and immediate deportation. Juan Osuna, Director of the Executive Office of Immigration Review at the Department of Justice, reported that 46 percent of all children, whether accompanied or unaccompanied, fail to be present at their hearings. And as these children fade into the shadows, they lose any real opportunity of gaining the legal status to remain in the United States. 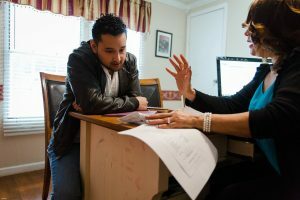 One migrant from El Salvador, 26-year old Rolan, a manager of a Mexican restaurant in Northern Virginia, had a typical experience. At the age of 17, Rolan pursued the dangerous trek across the U.S.-Mexican border in the hope of attaining a better education. But apprehensions drove him too, as gang predations near his home led him to flee his homeland. Many families were under the impression that it had become lawful for children to migrate to the U.S. 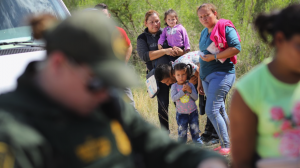 Interviews by Border Patrol agents with young migrants and their families revealed that there was a commonly held perception that the United States had relaxed its policies and would grant them permisos, or free passes, to stay. The summer months slow down the pace of immigration as people realize that setting out across the desert could be fatal if it gets too hot. It is not humanly possible for a person to carry enough water to survive the length of the trip. Tighter enforcement on the U.S. border and aggressive public-relations efforts to disabuse potential migrants of misconceptions about easy permisos have also contributed to recent decreases in migrations. Meanwhile, in response to pressure by the United States, Mexico has stepped up law enforcement on its southern border. Mexican “officials returned 3,819 minors to their home countries in the period studied (October to February), a 56 percent increase over the previous year,” according to the New York Times. The Mexican government has also increased enforcement on its southern border with Guatemala, making it harder for migrants to board the freight train routes through Mexico. The train, known as La Bestia, or Death Train, follows the route from Guatemala north into Mexico. Annually, almost half a million migrants hop aboard these moving cargo trains, suffering the severe heat and lack of water and facing physical dangers that range from amputation to death. Mexico is, at long last, taking a few steps to make conditions less dangerous for the migrants passing through its territory. Despite the drop in numbers of unaccompanied children crossing into U.S. territory in the past several months, the debate surrounding the issue is far from finished. Lamentably, however, we still have not come to the shared conclusion that these unaccompanied children deserve humanitarian assistance. President Obama has been urging Congress since July 8 last year to authorize $3.7 billion USD in emergency funds, but would spend much of the money on border security and on quicker deportations. Still, too little attention and resources are being directed to dealing with the humanitarian crisis in Central America. The president is doing too little, and the U.S. Congress is doing almost nothing at all. The poverty and violence of Central America and Mexico must be addressed. “There are not many opportunities for these kids. The violence and presence of the gangs have had a significant impact,” said Pacheco, referring to his home back in El Salvador. “Creating more cultural and extracurricular programs would also be useful for the children. These kinds of enrichment would at least expose them to positive experiences in the midst of violence,” Pacheco said. The nations of Latin America must take responsibility for dealing with the crises that are driving people beyond their borders, but the U.S. government must also join Central America and Mexico in tackling the root causes of the immigration crisis. Immigration policy in this hemisphere is failing. The United States must begin providing adequate visas for legal immigration programs, offer more opportunities for family reunification and normalize unaccompanied children’s’ status. Whether these children are confronted by border patrol agents or land in detainment centers, they must be treated humanely and respectfully, regardless of their legal status. The U.S. must provide an authentic case-by-case review of every immigrant’s claim for humanitarian relief. And finally, non-contiguous countries should move to adopt Mexico’s more stringent law enforcement and repatriation policies, for only this will help to stem the flow of unaccompanied children. The circumstances surrounding these young migrants must be dealt with now. If we do nothing, the children will continue to suffer unjustly.